Since 2004, the Ozone and Water Vapor group at NOAA/ESRL/GMD has conducted in situ measurements of atmospheric ozone mixing ratios from the surface up to altitudes in the stratosphere with small, lightweight portable ozone monitors. The ozone instruments, based on components from the 2B Technologies ozone analyzer, currently fly at locations around the world during routine vertical profiling and for special projects and campaigns. Due to our collaboration with other agencies and internal groups, the ozone profile data is generally available alongside other constituent data. Why Is Tropospheric Ozone important? Ozone (O3), a well-known constituent of the stratosphere (due to the media coverage of the Antarctic ozone hole), is also present in much lower concentrations in the troposphere. Tropospheric ozone forms due to chemical and photochemical reactions involving biological and anthropogenic emissions of nitrogen oxides (NOx), volatile organic carbons (VOCs) and hydrocarbons. Naturally-occurring ozone is at ground-level in low concentrations and is primarily due to stratospheric ozone (occasionally brought to ground level by storms and other atmospheric dynamic processes) and hydrocarbons released by plants and soil. Human activities (combustion, industry) can cause ozone levels near the surface to be high enough to cause negative effects on human, animal and plant health. Although ozone is not directly emitted, when NOx, hydrocarbons and VOCs are emitted by automobiles, gasoline vapors, refineries, and power plants, ozone is created with the help of UV light. Near urban areas, the highest ozone levels often occur during the summer in the late-afternoon, after the sun reacts fully with emissions of the morning rush hour. As the UV decreases in the evening, the photochemical production of ozone decreases. During the nighttime, when ozone production has ceased, ozone trapped in the nighttime boundary layer can decrease due to deposition and NO titration. Tropospheric measurements are often of interest in urban areas, because high ozone air can be a health hazard for those with respiratory issues and people exercising outdoors. When ozone reaches high levels, which can damage respiratory tissues in humans, warnings are issued. Rather than measuring these high urban ozone values that assess pollution, the Ozone Water Vapor Group primarily focuses on measurements of rural areas. Rural ozone measurements yield information on background ozone levels, which, since 1900, have risen globally. As the populations, industry and the number of automobiles increases, so does the interest in background global ozone values. Aircraft in situ tropospheric ozone measurements provide data relevant to: pollution events, lower atmosphere mixing dynamics, boundary layer stability, ozone trend studies, the validity of other samples collected in flight, and model initialization. 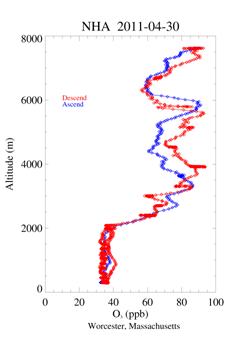 The primary purpose of the data collected by the aircraft program is to provide a view of how the large-scale horizontal and vertical distribution of the measured trace gases change throughout a given year over the continent. Therefore, aircraft profiling is conducted at rural rather than urban locations in order to assess background constituent information. However, data from these flights has frequently identified biomass burning and other pollution events. Additionally, the ozone profiles often indicate stratospheric intrusions in the mid and upper troposphere. These interesting findings are often validated with other constituent data from collaborative instruments on board flights. 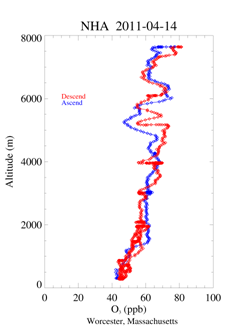 Above) Aircraft ozone profile over Worcester, MA on April 14, 2011 shows a typical Spring vertical profile. Above) Aircraft ozone profile over Worcester, MA on April 30, 2011 shows higher ozone levels aloft, possibly due to stratospheric downward mixing or distant biomass burning.